A .Net Component is available for rapid development of I2C Applications in .Net software, this is highly recommended over the integration of the legacy OCX (SDK v2.3) into .net. The Official SDK ver 3.0 is not available yet, but information available on this temporary page should be enough to get you developing your own applciations. Please click here to download the latest I2CClass .net component. Please click here to download an example C# I2C Monitor. 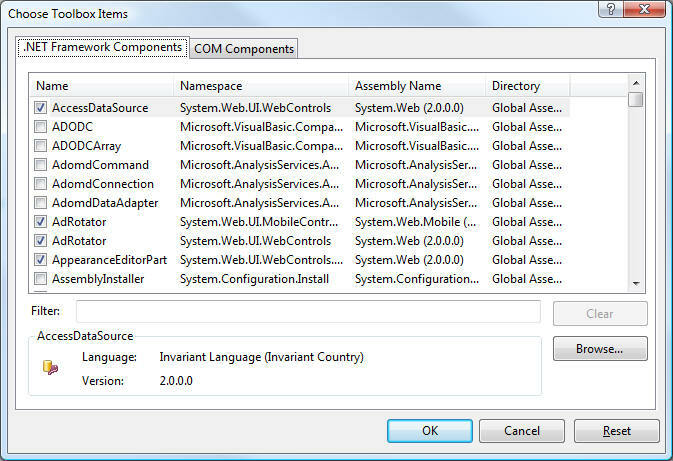 To the component in a .net application, you first need to add the component to the Toolbox. This can be done by right-clicking inside the Toolbox and selecting "Choose Items...". This opens up the Choose Toolbox Items Dialog box. Click "Browse..." and select the I2CClass.dll (which can be downloaded from the link above). The I2CClass Component is added into the Toolbox and cab be added to the user's application form like any other control. The use of the control is very similar to that of the OCX, and for the moment the HELP from the OCX can be used as a reference for the use of the component, the help file is installed with the SDK (v2.3) which can be downloaded by clicking here.